MK Ayman Odeh, who attacked police during Second Intifada, vows to petition Supreme Court over Bentzi Sau's past of cracking down on terror. 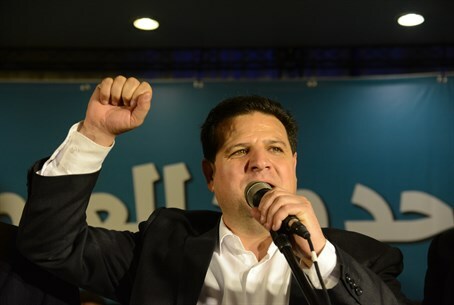 The Joint Arab List, the third largest Knesset party which is a conglomeration of the various Arab parties, has expressed its strident opposition to the naming of Bentzi Sau as Police Chief in place of the outgoing commissioner Yohanan Danino. As quoted by the Hamas paper Palestine, MK Ayman Odeh, chairperson of the Joint Arab List, said on Wednesday that "the 'internal' Palestinian sector (i.e. Arab citizens of Israel) will not cooperate with Police Commissioner Bentzi Sau due to his involvement in the events of October 2000, during which 13 Palestinian youths were killed by gunfire of the occupation police." Odeh's reference relates to clashes during the outbreak of the Second Intifada terror war, during which large-scale violent riots broke out throughout the Israeli Arab population in support of the terror wave and the Fatah movement now headed by Palestinian Authority (PA) Chairman Mahmoud Abbas. In a published statement Odeh said that the Joint Arab List will petition the Supreme Court against Sau's appointment, saying, "the Or Commission clearly determined that Sau was a partner in the crimes of October 2000 and recommended not to advance him in the police personnel for four years." He claimed that "Sau's acquittal was not due to innocence, but rather the claim that there wasn't evidence similar to in the closure of all the other cases at the time. Therefore we oppose his appointment to the post of police commissioner, and we will not cooperate with him. We will turn to the Supreme Court on this important and loaded issue." While Odeh made accusations about Sau's past action in putting down terrorist riots, the new MK has recently gone on record revealing his own subversive past in which he was highly influenced by the Palestine Liberation Organization (PLO) terrorist organization and the 1987 "First Intifada" terror war. He admitted he took part in countless violent protests, relating how he used to attack police officers in every protest. In 2001 the 17-year-old brother of his wife Nardin Asleh was killed while taking part in a violent clash against Israeli police as part of the Second Intifada terror war. And in late April, Odeh visited arch-terrorist Marwan Barghouti in jail; Barghouti is serving five life sentences for planning countless suicide terror attacks and is thought to have masterminded the Second Intifada. He has continued inciting terrorism from his jail cell. The United Arab List has gone on record classifying all Arab terrorists jailed in Israel - even those serving time for the most brutal murders - as "freedom prisoners," and the party is pressing to have them all released immediately.